Short answer: Visual Evangelization is the use of imagery to communicate various spiritual themes and/or truths to the viewer to help initiate a contemplation of the things of God in order to promote conversion or a deeper walk with the Lord. Long Answer: Father God designed us to be visual learners and throughout art history, artists have used shapes, forms, symbols and colors to communicate with their audience/viewers. Regardless if it was for inspirational, educational, or recreational purposes, artists have used visual communications to teach, inform, or entertain their audience. Visual communication is a powerful tool in the hand of an artist. They can inspire greatness or promote malevolence to a viewer by how they visualize their thoughts on various subjects. When the Gospel is considered, there are many ways to represent spiritual truths. 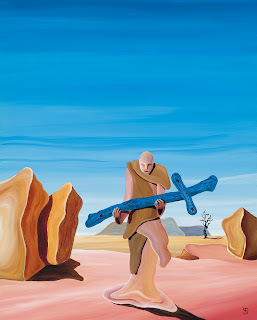 Some artists are more literal in the interpretation of scripture and will illustrate various stories from the bible. Some artists will work in a more realistic style. Some artists will work in a predominately abstract style. The variance is as diverse as the number of Christian artists who have consecrated the works of their hands to the Lord. As a Christian, I understand that we have a part and God has a part in evangelizing. If we are diligent in doing our part, He will do His part. As a result, I always start the creative process with prayer to seek a theme to express. During the execution of a piece, I constantly pray that the works of my hands would bring glorification to the Lord, and that the Holy Spirit would guide the viewer into deep contemplation about what has been put before them. How can patrons assist in the visual evangelization process? A lot of Christians long to be able to share their faith effectively, but often they don’t know how to go about it, get confused, scared, feel unprepared, etc. This is where religious art can be used as a conversation starter/springboard for evangelism. Many patrons hang their fine art purchases in their home and this is a great place to evangelize to unbelieving friends, co-workers, and family members, as this is a non-threatening environment. It's also good to note that in a relaxed, private home setting, people are at ease and are more likely to engage in deeper intellectual and theological discussions. In addition to using the painting synopsis that has been provided for you, I highly encourage using the evangelization concepts taught by The Way of The Master: http://www.wayofthemaster.com/. Their website has several educational audio and video clips that can be reviewed for free. They also have materials/studies available on how to evangelize effectively. Two books in particular, The School of Biblical Evangelism Textbook and The Way of The Master by Ray Comfort and Kirk Cameron, have superb information about leading people to Christ through the “good person” test, which is an appeal to the conscience through the exposition of the Ten Commandments followed by the Grace of God through Christ Jesus' work on the cross. The patron, once fully equipped with knowledge, prayer and relying on the Holy Spirit can then move forward to shine a light in the lives of others. The Holy Spirit will be able to do what the art and you can’t do, which is bring about revelation of a spiritual truth, or cause a hunger & thirst for truth to start growing. If Father God has put an unbeliever on your heart to reach out to, you may want to extend a dinner invitation to them. Try to plan 1-2 weeks out so that you have enough time for spiritual and logistical preparations. When your guest(s) arrive, you decide to save the spiritual discussions for later in the evening and start with a prayer at the beginning of the great meal you have prepared. You and your guests have table talk about the common ground you share (work, family, or any other type of relationship you have with them). Your goal to keep the conversation light is working well. After dinner, when you move into the family room or wherever the NuArt painting is on display, you start turning the conversation to spiritual things by opening up dialogue on the meaning of the painting by the artist, as given in the synopsis, and ask them what they see in it? You listen to them and note that every viewer will see something a little different. Next, you talk about what the painting imagery means to you personally, why you purchased it when you did, and then proceed to deeper into other spiritual matters, such as the “good person” test as outlined by The Way of the Master. After your goal to communicate, inform and give direction to John and Jane has been completed for the evening, you give them a few resource items as they are leaving after you have invited them to join you at church and you continue to pray for them for the next week or however long the Spirit leads you. What you have just done is an act of hospitality (the meal), charity (love for them as shown in the concern of their eternal future) and friendship (as you gently expressed your faith by taking care not to bring offense to them). You have sown precious seeds into your guests’ lives and sometimes it takes a little while for the seeds to sprout and grow. After your Evangelism Evening is over, you may want to take some time to review the evening for future enhancement. Were questions asked that you didn’t have answers for? If you do research and get the info that was requested back to your guests, it would be a great show of attention to detail and concern that you have for them. Did the spiritual conversation go smoothly? If not, what made the discussion tense? Is there anything extra you can do for future preparations on evangelism evenings that you plan? Remember, experience is a great teacher and we learn as we seek wisdom, pray and go. Be salty, so others will thirst for what you have and shine your light into the darkness!